Arizona Tree Frog Hyla eximia; Photo by Vivipro/Wikipedia (Use Permitted with Attribution). Found in the mountains of central Arizona and western New Mexico, The Arizona tree frog inhabits oak, pine and fir forests above 5,000 feet elevations. 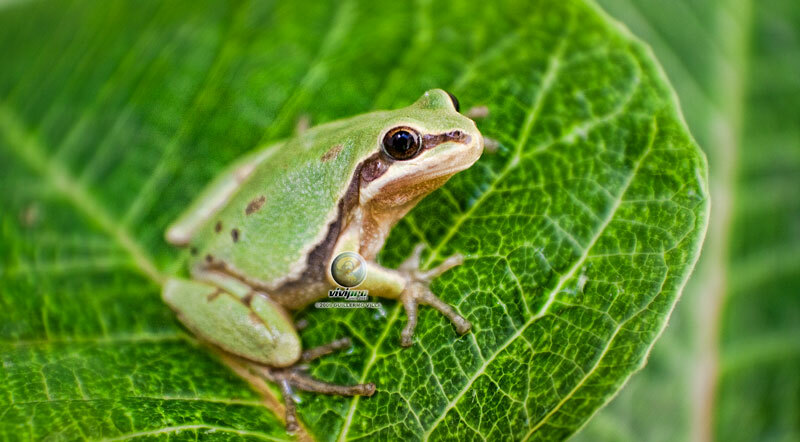 Also called mountain frog, the diminutive Arizona tree frog is only 3/4" to 2" long. It is usually green but can also be gold to bronze in color (with a whitish belly). Arizona tree frogs have a dark stripe that starts at the snout, runs through the eye, and extends along its body to just before the rear legs. It may also have spots or bars on its back. Primarily nocturnal and spending most of the year inactive (as do most amphibians), Arizona tree frogs may be heard calling sporadically from tree tops in the early part of the rainy season (only the male vocalizes, making a nasal clacking sound). Their diet consists entirely of insects, shrubs, or dense grass around water.